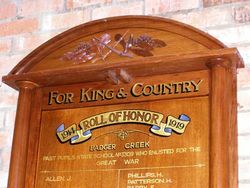 The Badger Creek State School was well filled on Saturday evening, May 24, when a large and representative gathering assembled for the purpose of assisting at the ceremony of unveiling the school honor board. The chair was occupied by Mr. C. A. Robarts, of Coranderrk, being supported by the president of the Healeville Shire (Cr. W. A. Burnside) on the right, and Sergt.-Major Rennie on the left. Mr. W. H. Everard, M.L.A. 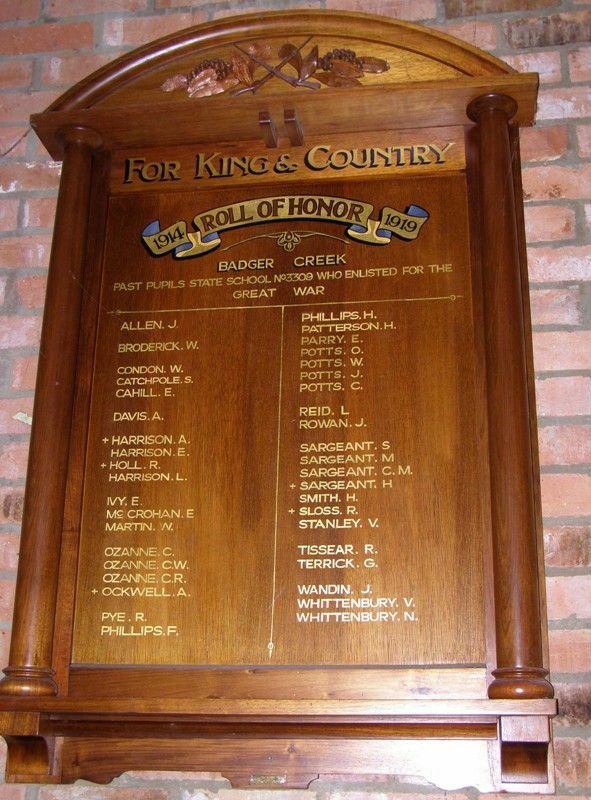 for the district, had undertaken the duty of unveiling the honor board, but at the last moment found it impossible to be present, and a telegram was read from him by the chairman, apologising for his absence, and re gretting that he would be unable to perform the ceremony. Healesville and Yarra Glen Guardian (Vic), 7 June 1919.